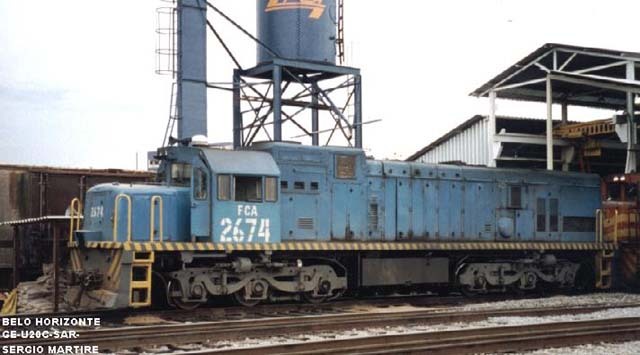 An order of 25 U18C's were supplied to SNCFA in 1976. Numbered as 060-DJ-1 - 060-DJ-25, builders numbers of 41741-41765. 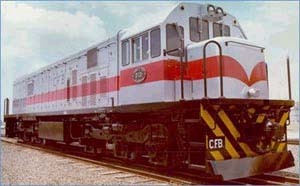 Fitted with 7-FDL-8 engine of 1980hp. 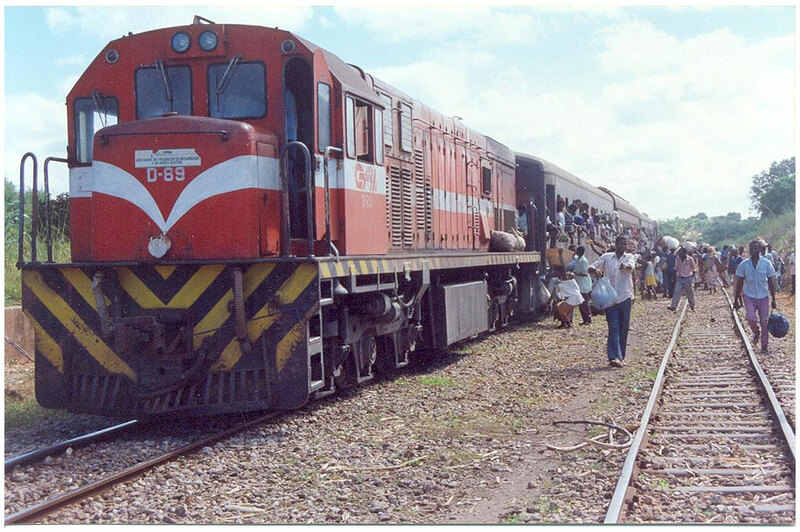 Standard gauge, C-C Locos. Front and side view. Photo by GE. 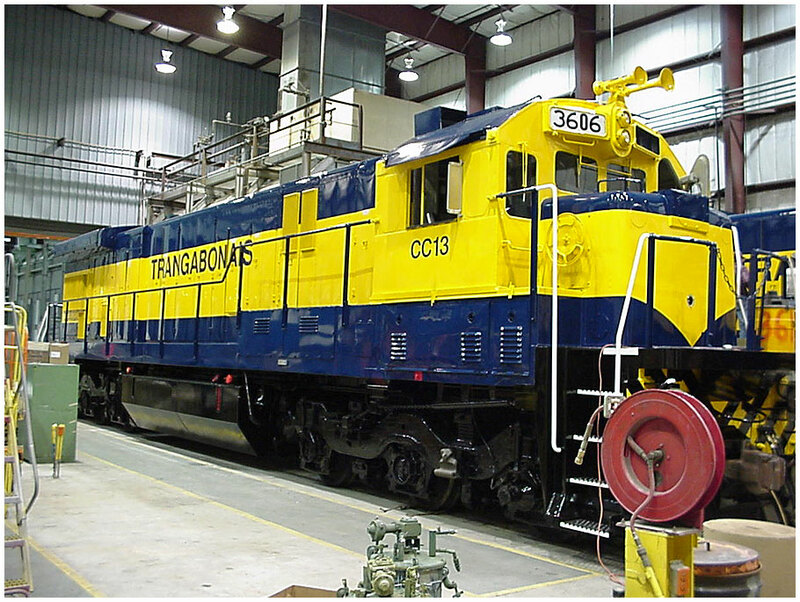 Rear three quarter view of the same Loco. 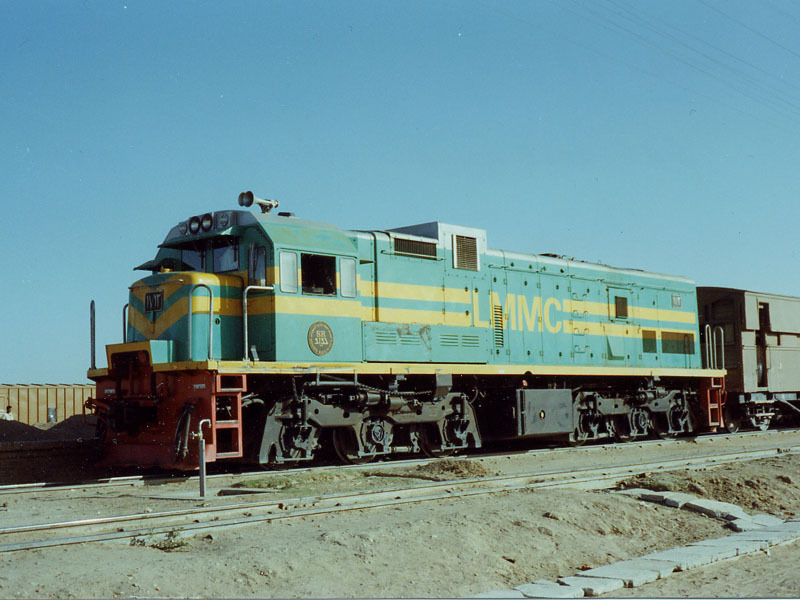 Algeria runs large numbers of GM built Locos, this small order of GE's has not been repeated. 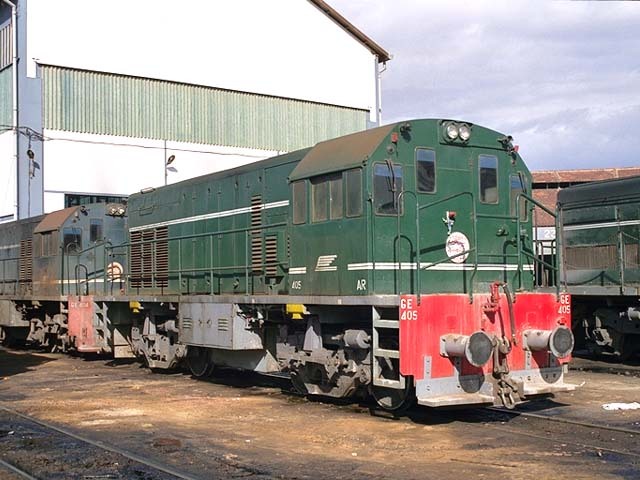 No info on where the Locos can be found is known. A U20C belonging to C.F. 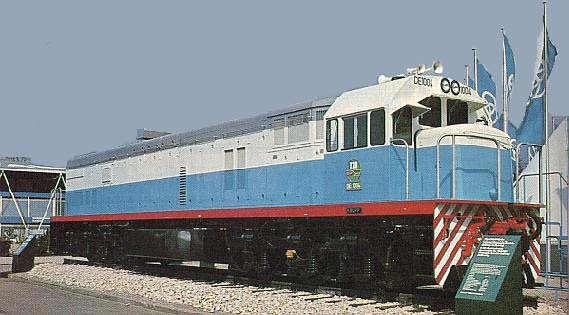 de Luanda, one of forty such examples built between 1967 and 1972 for this company. 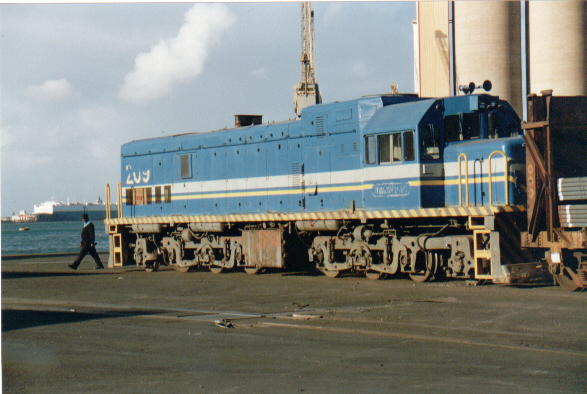 An unidentified U20C, seen in Brasil after completion and shipment to C.F. de Benguela. 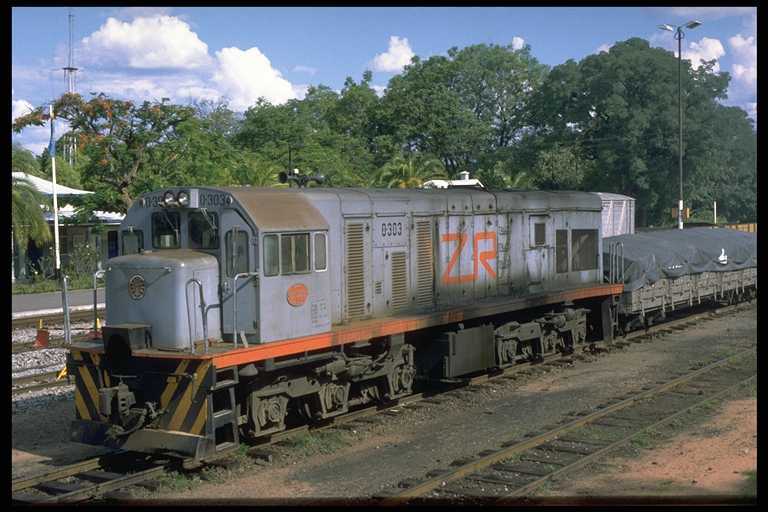 A batch of twelve U20C's were built in 1982 in Brasil. 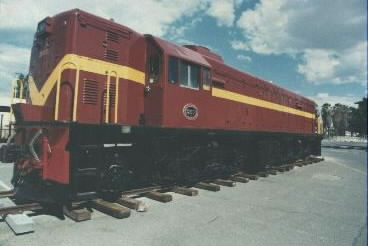 All previous 22 examples of this class being built at Eire. 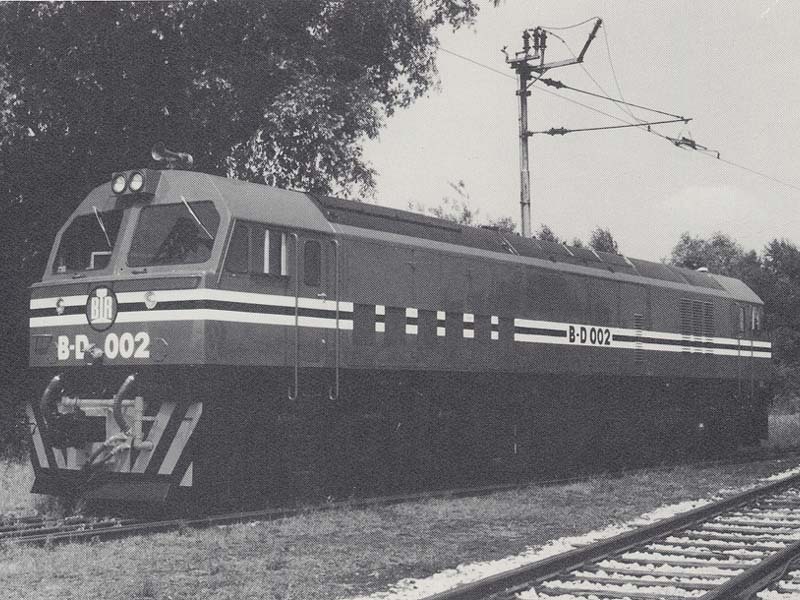 Botswana UM22C BD-002 is seen in Germany, after being built by the Krupp factory in Essen. 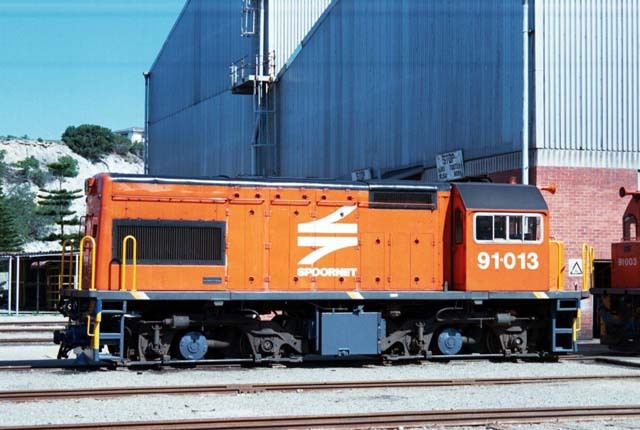 One of 12 such Locos built 1981. 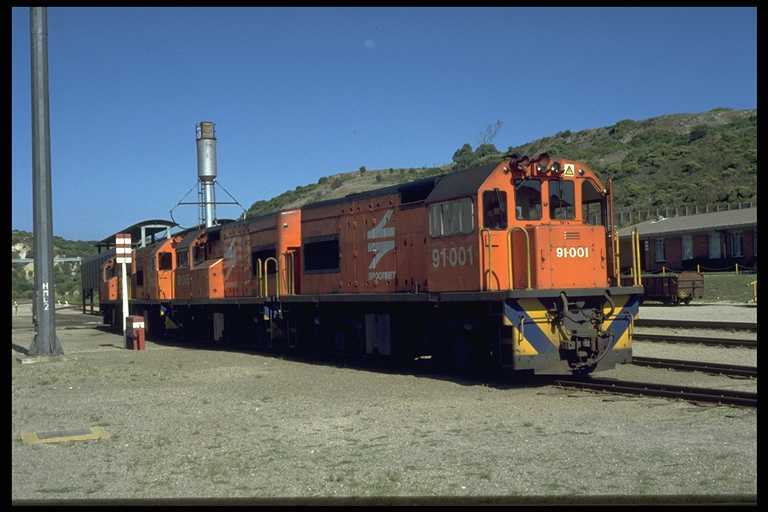 Believed to be later re-numbered into the 101-112 series. 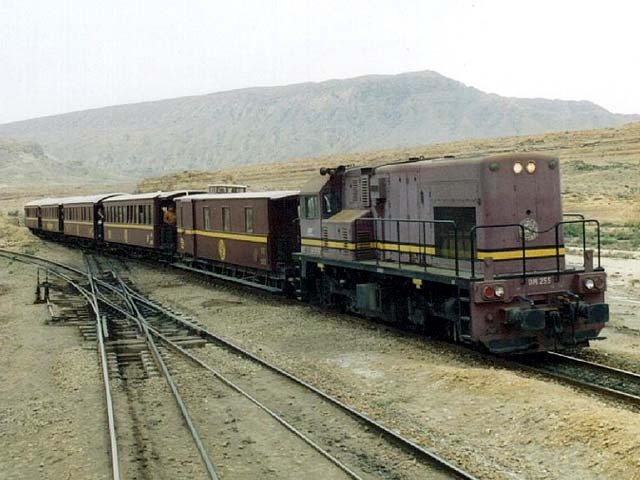 Narrow gauge (1.067m), C-C, fitted with 7FDL12 engine, 2140hp. Built with builders numbers 5520-5531. 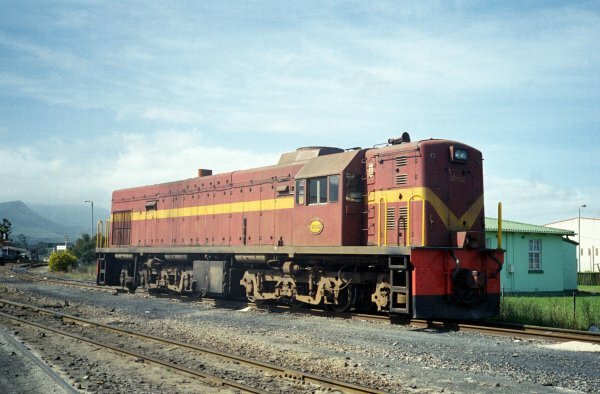 Botswana UM22C B-D.001, later renumbered to B-D.101 is seen at is seen here at Bulawayo, with enginemen's van in tow, in July 1985. 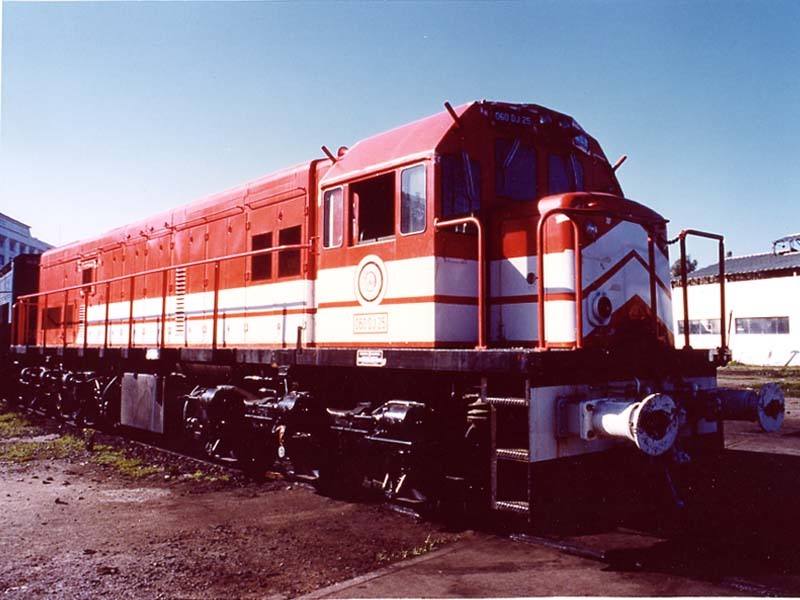 The locomotive has just brought in the Johannesburg mail train, built by Krupp 5520-5531 in 1982 (1640 kW FDL7 V-12). 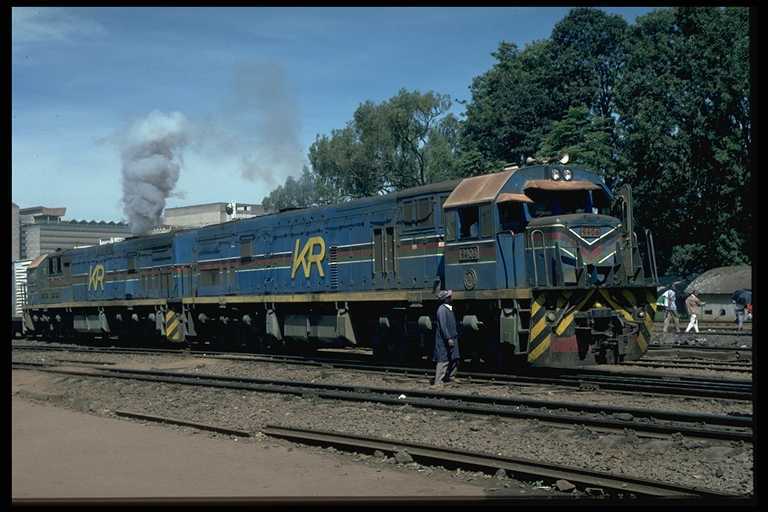 Photo by Jean Dulez, with permission from "Locomotives of Zimbabwe and Botswana" (available through railbooks.com). 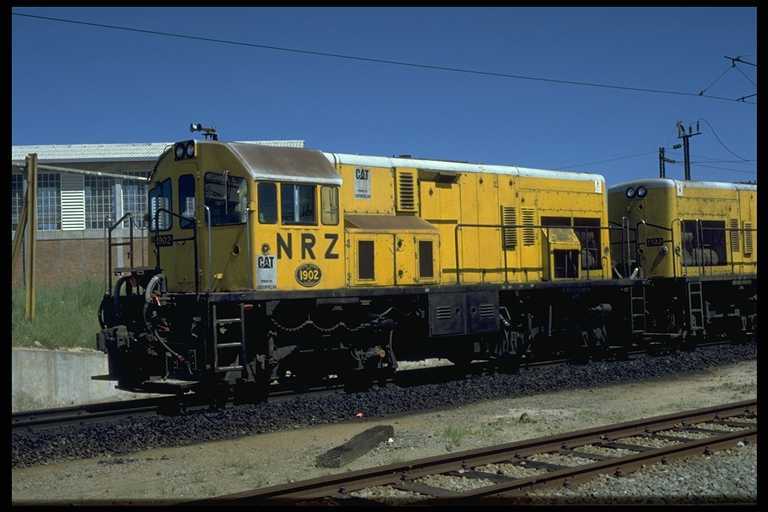 The aluminum cab side plates 80xx were purely for NRZ computer database purposes during the period when maintenance and repairs were carried out at Bulawayo. 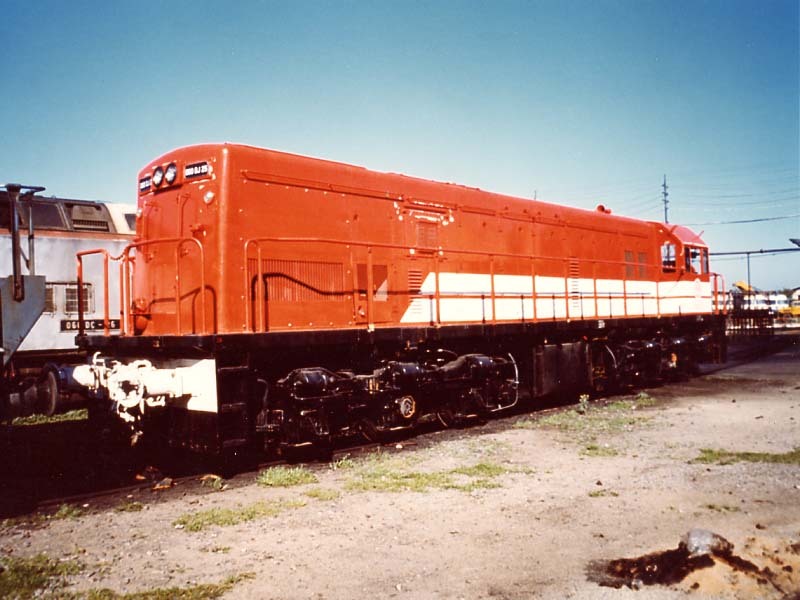 Status (old No/1992 No): BD.002/102 Badly damaged after head-on with NRZ DE.6 No 1600, Artesia,4.1985. Rebuilt by ZECO. Further accident damage. Written off 1995? BD.007/101 Severe accident damage. Written off 1995? 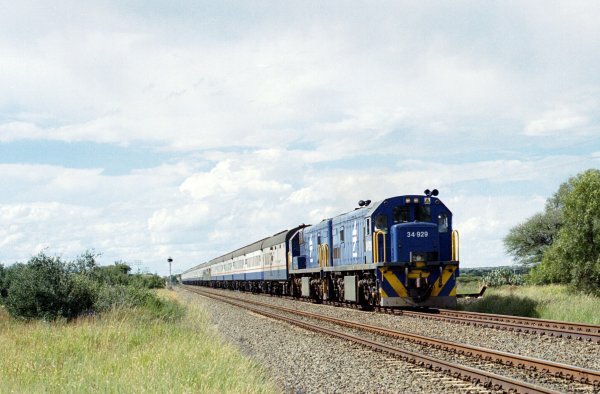 Brazilian-built U15C No BD.341 is pictured leaving Lobatse on the southbound stopping train in December 1994. 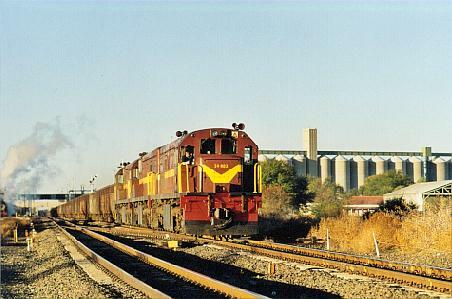 This service operated all the way from Bulawayo to Mafikeng. 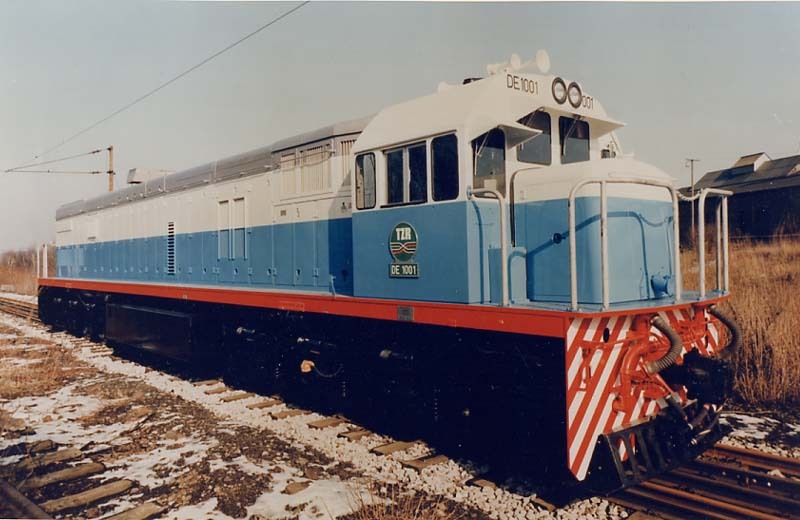 One of ten built by GE do Brasil (2501337-346) of 1991, (GE 1125 kW FDL8 V-8E). 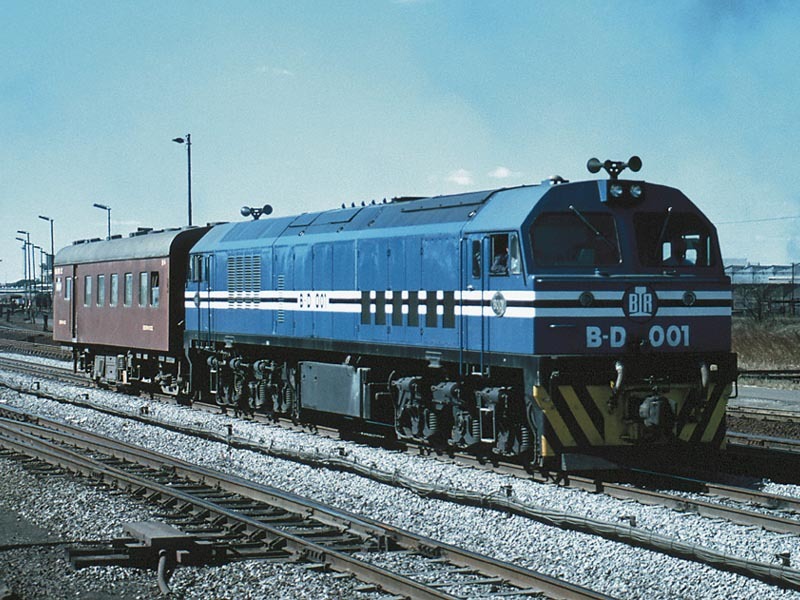 Photo by Jean Dulez, with permission from "Locomotives of Zimbabwe and Botswana" (available through railbooks.com). 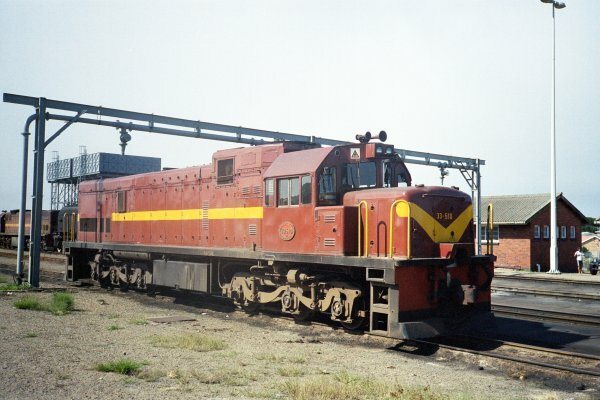 Photo needed Gabon operates twelve UM22C's of 2335hp. Supplied in two orders in 1977 and 1984. 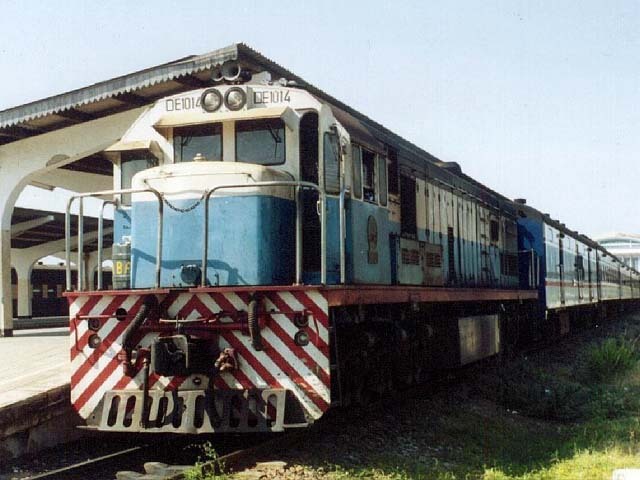 The Locos are based in the Port of Owendo. 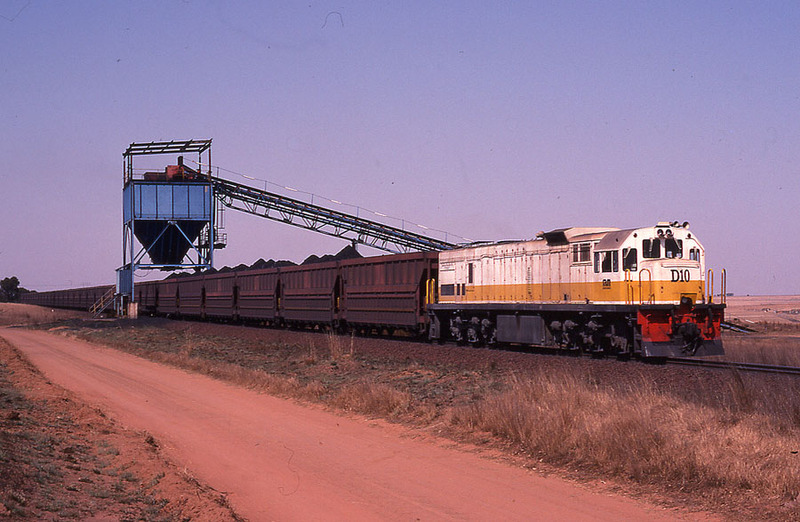 For freight service, lumber and iron ore and they were still running in late 2000. 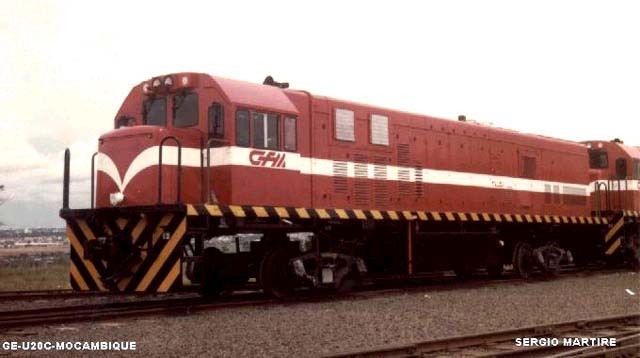 CNRL 11 & 12 for Gabon, were seen at Newport News,VA 3/6/97-Green body, orange stripe and white letters. 11 b/n 40017 11/74 built as ATSF 8773 to 9545 to NRE to CNRL, 12 b/n 40029 1/75 built as ATSF 8785 to 9552 to NRE to CNRL. 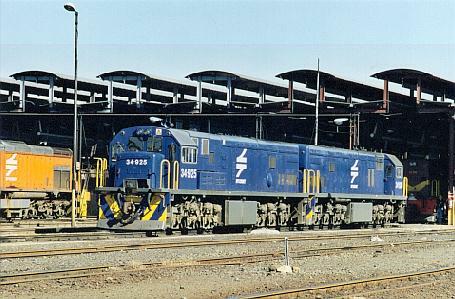 May 2000, According to reliable sources, the following C30-7s are being loaded aboard a ship at Norfolk's Lamberts Point Docks for shipment to Gabon for the Trans Gabonis RR: They are painted blue and yellow and arrived late last week. Any further information is appreciated, including what were CC1-CC12? 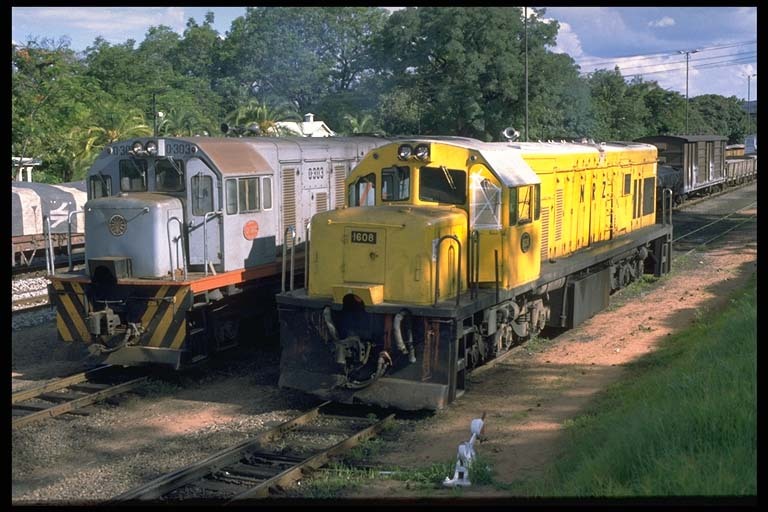 Other News: In the take over from OCTRA, Trans Gabonais took ownership of 20 or 22 GE U22 of which only 6 are operational and 2 GE U30C-7 and awaiting to take delivery of 4ea pre-owned GE's U30C-7. I do know that a mining company utilizing Trans Gabonais track have 9 immaculately maintained GE U30. 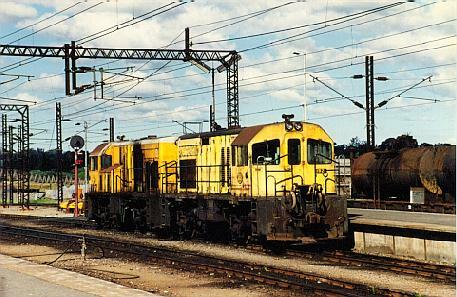 NamRail, the new name for TransNamib, has rationalized its diesel fleet to 41 locomotives, mostly dated ex-SAR U20Cs as well as a couple of even earlier U20C1 types. 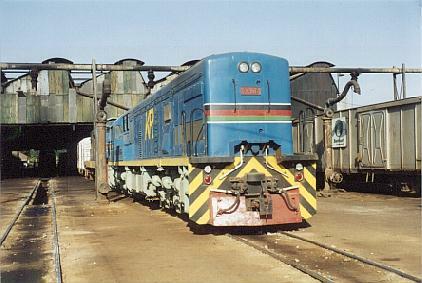 Other units have been sold to Brazil and Sudan. 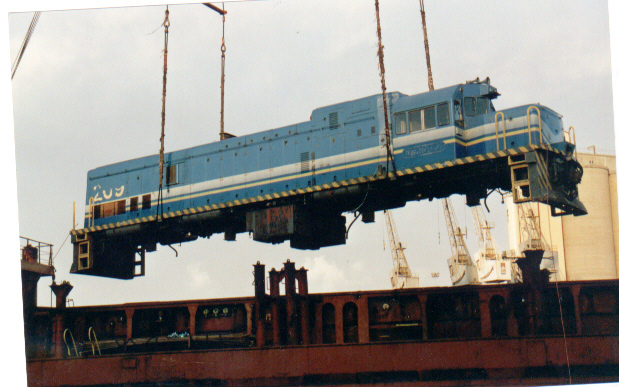 A refurbishment program is resulting in some of the wrecked locomotives being shopped. 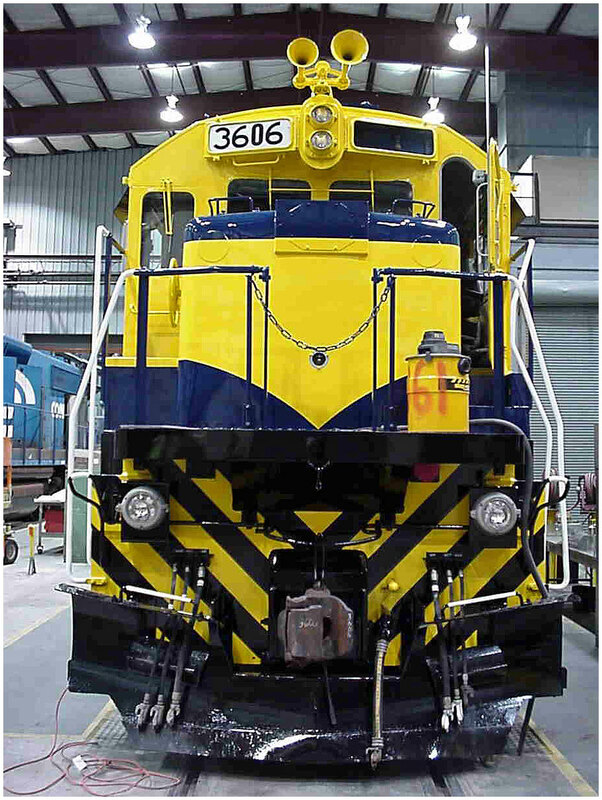 The 400 series numbering is now being changed to a 500 series. 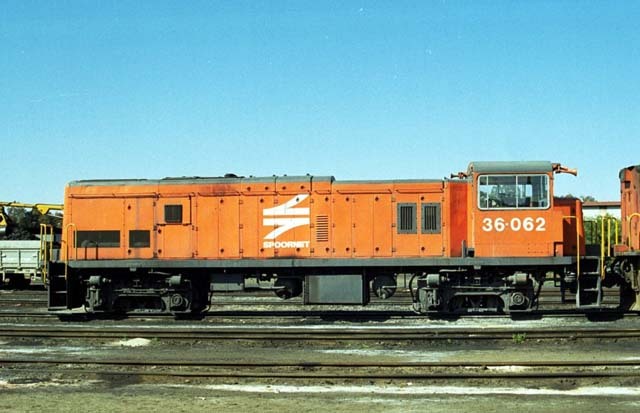 The 33 prefix from South African Railways ownership has long been dropped. 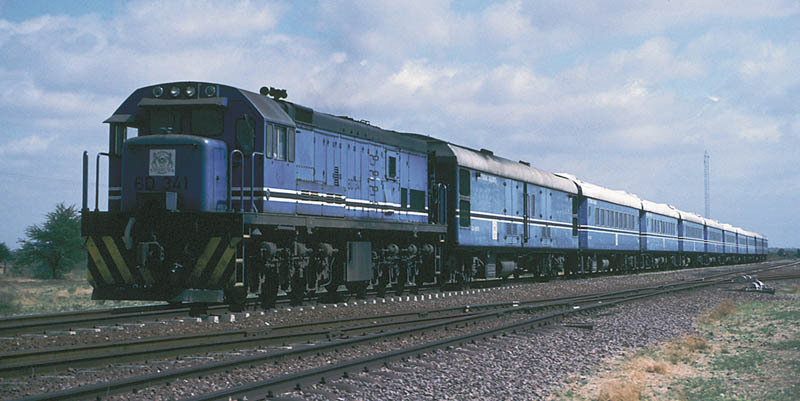 The U20C1 locos entered service on the SAR from General Electric USA in 1966 and the U20Cs were built in South Africa between 1968-70. 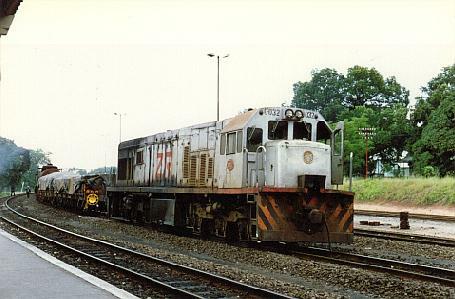 Picture shows two GE's on a Karasburg - Windoek express in September 1999. Karl W Koch, in Fern Express magazine 65. 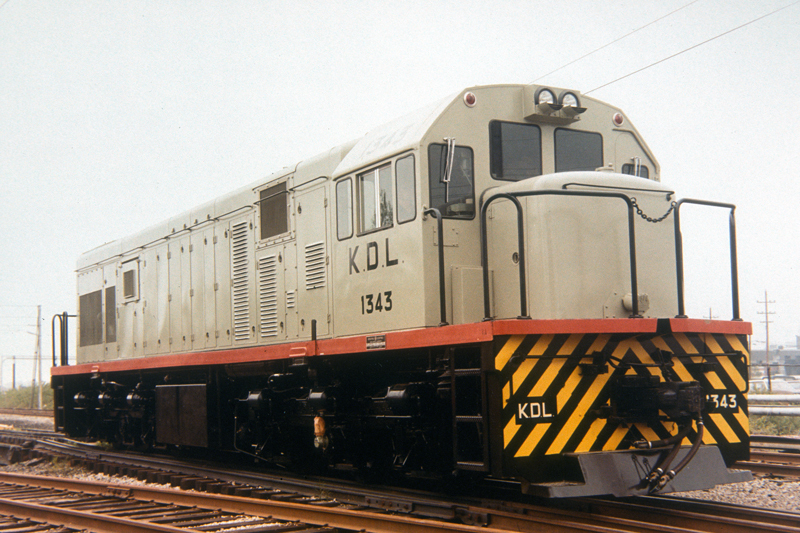 The class 31's were formerly Class 1-DE, the forty five Locos were numbered in the D-700 - D-744 series. 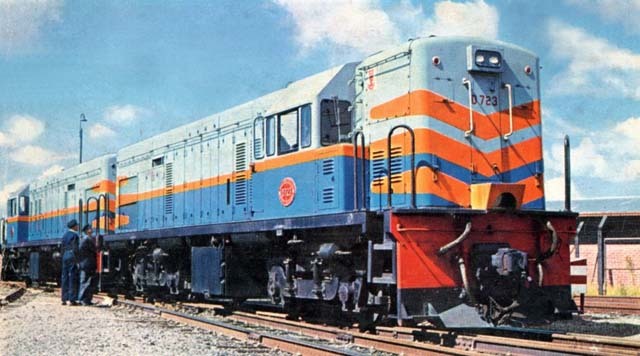 They were the first of the SAR's diesel electric locomotives delivered by GE during 1958, type U12B rated as 1320hp. 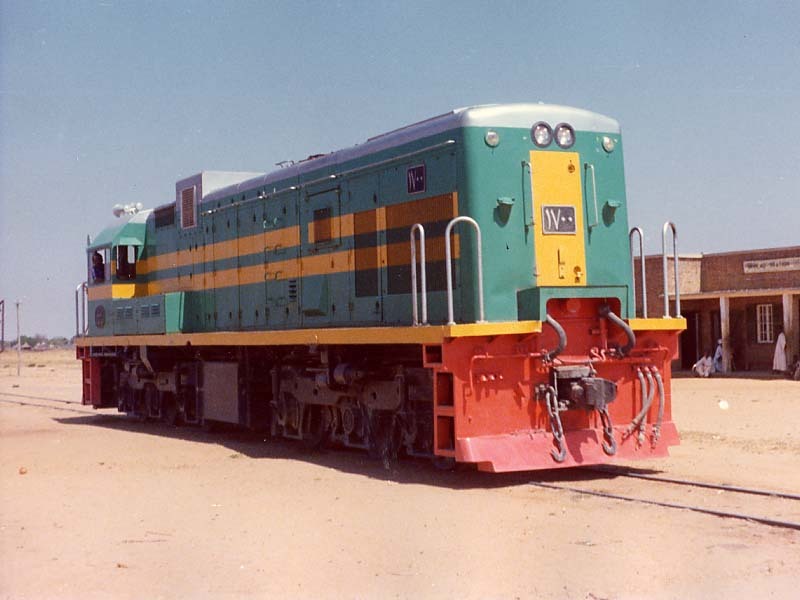 Sudan Railways U15C class leader 1700, one of the ten built in mid 1975. 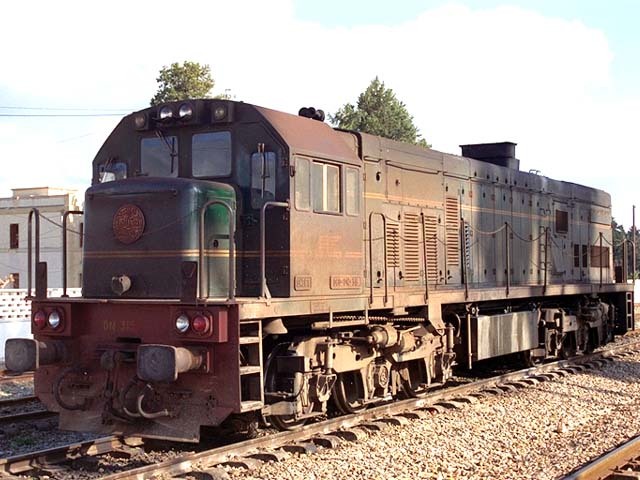 Fitted with 7 FDL 8 engine of 1650 horse power, narrow gauge, 1.067m, A1A-A1A arrangement. Photo taken by GE. 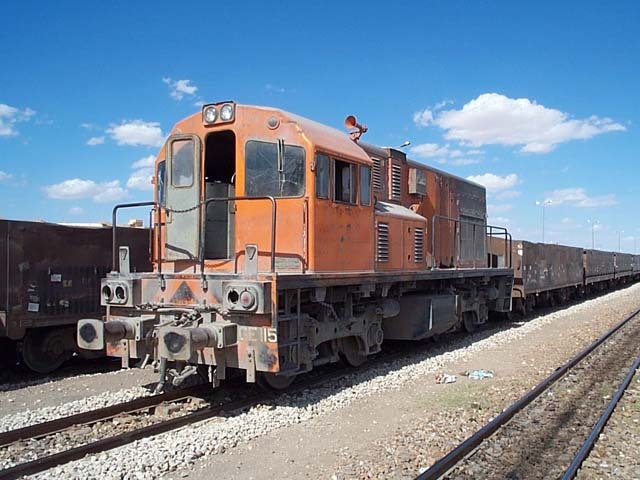 GE-405, a small General Electric Bo-Bo switcher is seen on the depot as Sfax. 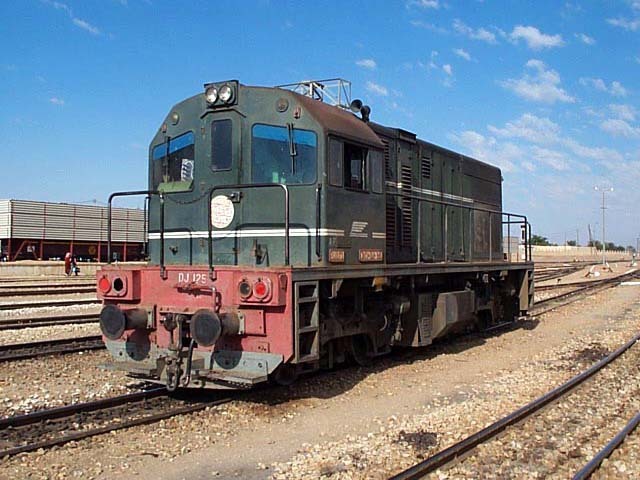 All of the small class of GE U6B Locomotives are used in the Sfax area. 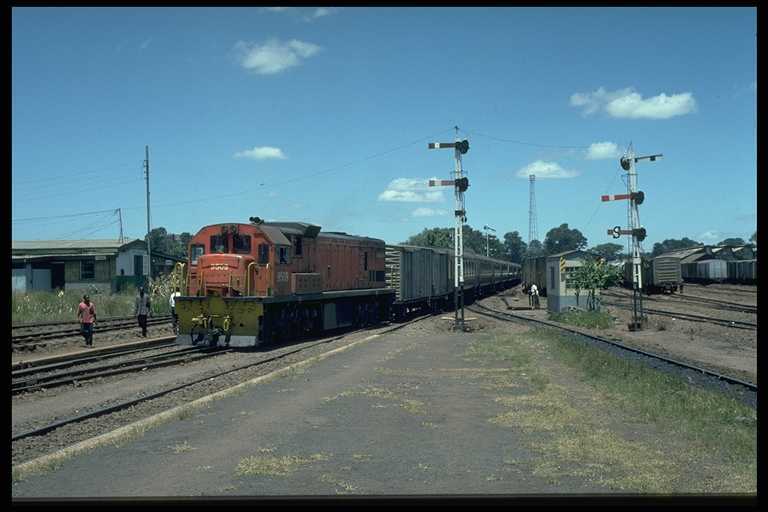 They send their life shunting phosphate and other freight wagons. Picture taken on Saturday 28th November 1998. 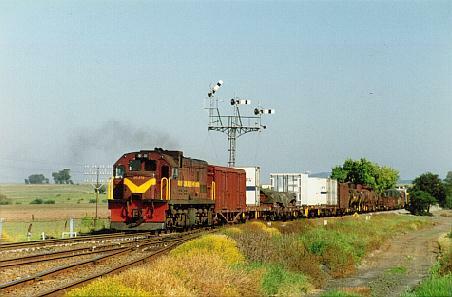 040-DM-255 is seen arriving at Selja with the "Red Lizard" tourist train from Metlaoui. The train runs most days. DM-255 is fitted with an auxiliary power supply for lighting on the train. 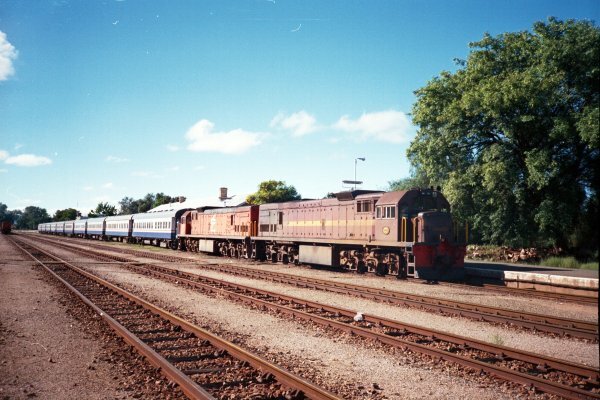 And is painted in the matching maroon livery. Seen on 26th November 1998. 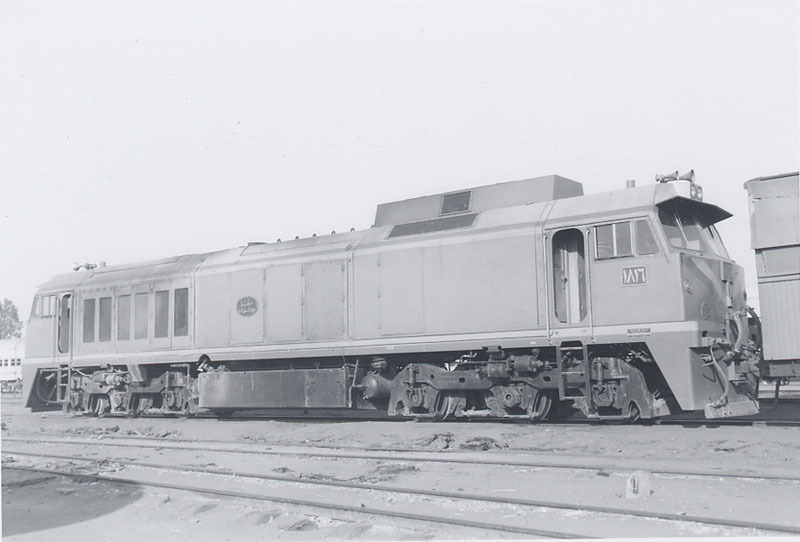 GE102, one of the first batch of five U6B's supplied to Phosphates de Gafsa in early 1976. 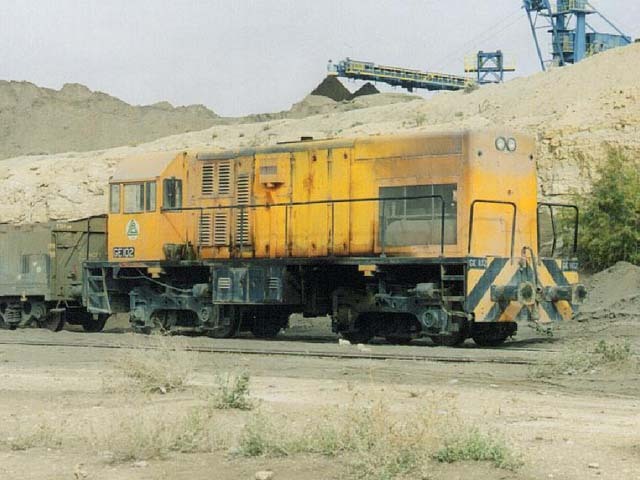 Used for shunting phosphate wagons around the mines located in the south of the country. 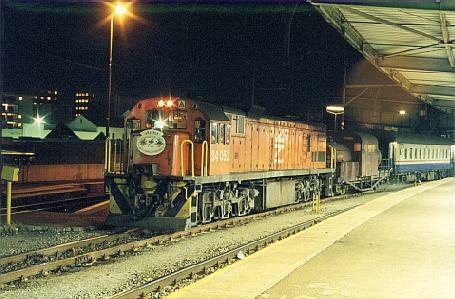 Seen at Selja on 26th November 1998. 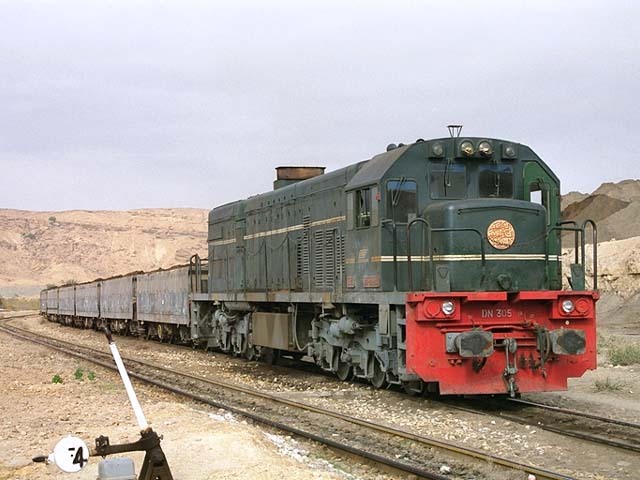 060-DN-305, one of twenty U22C's at Selja with a loaded phosphate train ready to start on the fifteen kilometre downhill journey to Metlaoui in southern Tunisia. 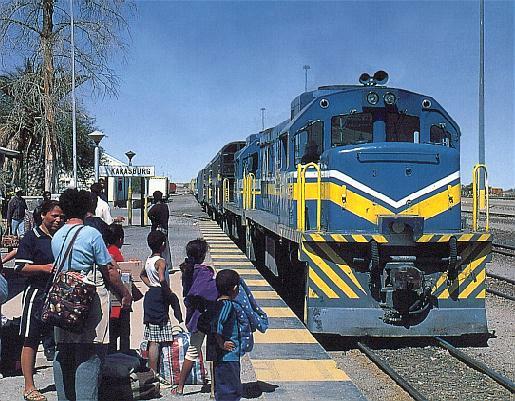 The train passes through the spectacular Copper Canyon route. 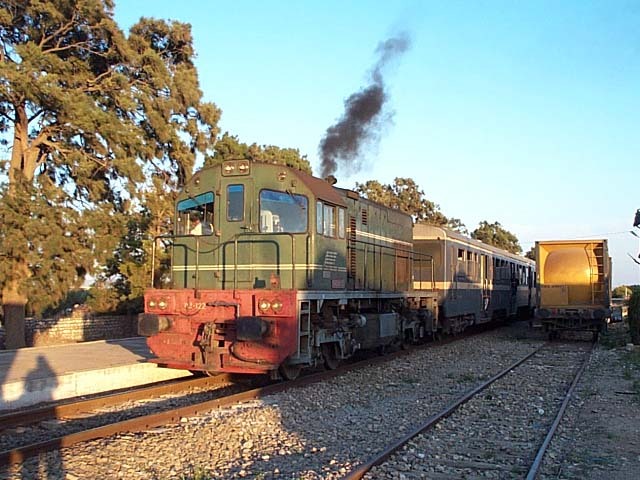 At Metlaoui the train had a crew change then continued north to Gafsa, where it then traveled over the freight only line to Gannouch. 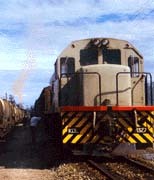 (Gannouch is the location of freight yards, just north of Gábes). 26th November 1998. 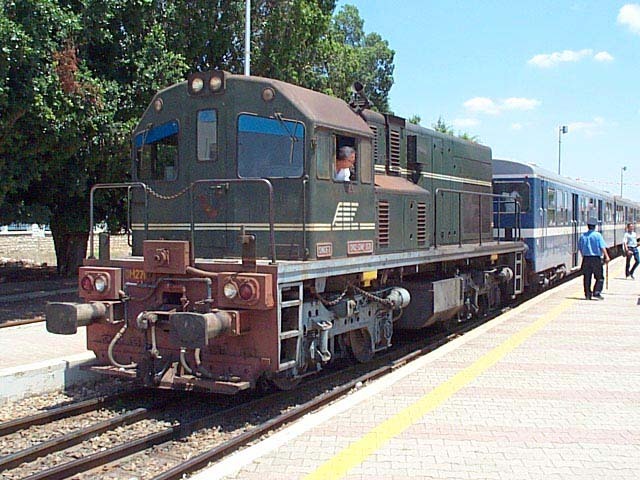 U22C Loco 060-DN-315 of 2500hp is seen as a reserve engine at Beja, half way along the standard gauge line from Tunis-Ville - Ghardimaou. 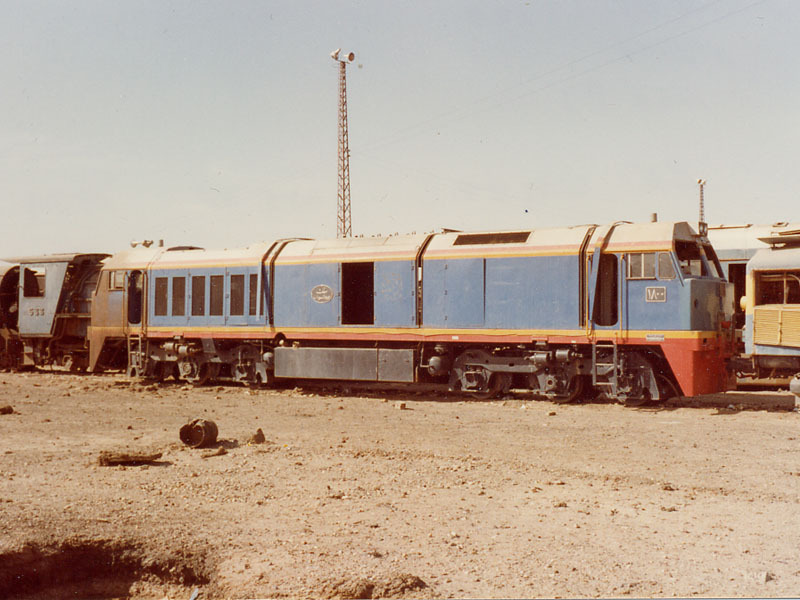 Of the twenty U22C’s that were built for Tunisia in 1981, five are used on the standard gauge lines and the others are used on the narrow gauge lines. Picture taken on January 24th 1994. 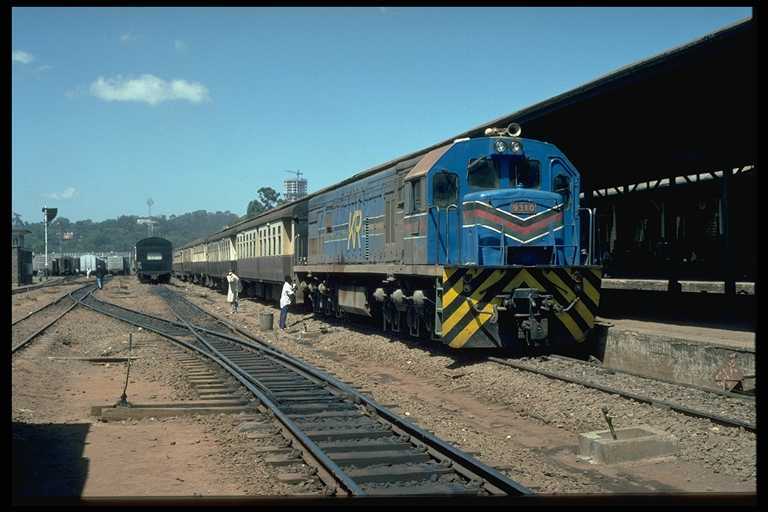 TAZARA, German built U30 Loco DE1001 is seen in Germany before delivery. TAZARA, German built U30 Loco DE1004 is seen on display at Hannover during a trade exhibition, before delivery. 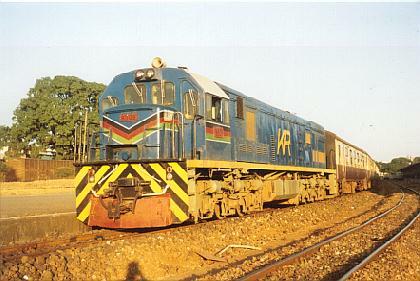 All main line (trains 1, 2, 3, and 4) and stoppers on main line and Kidatu branch are DE1001 worked. One of the fifty U15 supplied to SNCZ (Congo au Katanga) between 1971 and 1974.